2011 seemed to be the year when things popped up everywhere. Restaurants, bars, galleries, and shops all popped up and popped back down again. This is a trend that is all about being in the know and quick off the mark. Pop ups have been praised for making use of empty shops and units and for giving less established chefs the means to make a name for themselves. South Wales has embraced the supper club trend with several examples now established, but pop up restaurants haven't seriously caught on here but that may be about to change. Now The Celtic Manor is getting in on the act, taking over, for 4 nights only, the unit on King's Road that Mimosa occupied for approximately 30 seconds this year. Pop ups are often themed and by their nature require limited menus and Hide N Sea is more or less a direct copy of the very successful Burger and Lobster, the London mini-chain with a haiku length menu of 3 items. We booked in for opening night, trekked through some pretty torrential rain and wind, and arrived soggy and slightly grumpy for 7.30, surprised to find ourselves at the tail end of a launch 'party' that did nothing to improve my mood. Around 30 people, dressed up to the nines, were jostling around the cramped dining area and we had to push through to get to our table. The offer to hang our wet coats up was gratefully accepted and promptly forgotten which irritated further. Subsequently placed under some pressure to order food, we continued to be jostled and were unable to hold a conversation over the din. A quick complaint to the front of house team and... the problem was swiftly and professionally resolved. The party guests who were eating were encouraged to their tables, orders taken and good humour was restored. I ordered a drink from the cocktail menu, The Bowery (Champagne, Dubonnet, Hendricks, Angostura Bitters) £6.95, expertly made and prettily presented. The drinks here are clearly as important as the food. To eat I ordered a Lobster Roll at £20, (Fresh lobster meat smothered in spicy Marie Rose sauce in a sweetened brioche bun, served with smoked sea salt seasoned fries and dressed side salad), which actually arrived with a gravy boat of Bearnaise sauce. 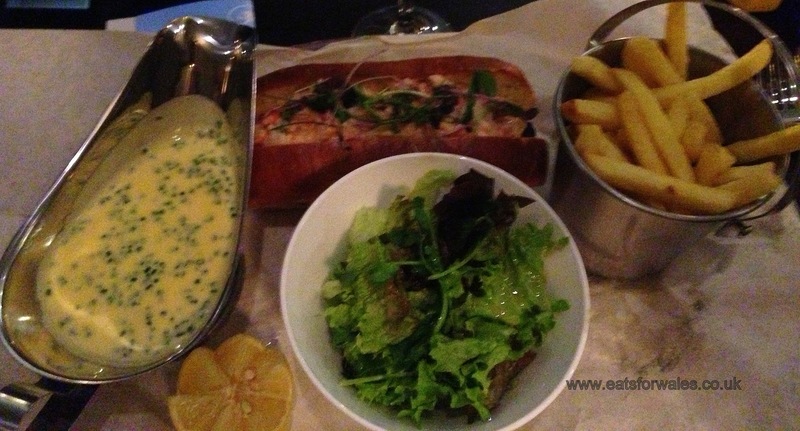 Plenty of lobster, lightly sauced, a good quality roll and the fries were good. If the salt was smoked, I couldn't taste it but I didn't care. By the time I finished I was stuffed. He ordered the 8oz Welsh Beef Burger £15 (A succulent homemade prime Welsh beef burger on a sweetened brioche bun, topped with mature Welsh Cheddar, crispy bacon, tomato, lettuce and sliced gherkin, served with smoked sea salt seasoned fries and dressed side salad) which I was informed was cooked well and very tasty. The other options are basically lobsters at 1lb for £20 or 2lb for £30 with the fries, sauce and salad and this is what most people ordered. 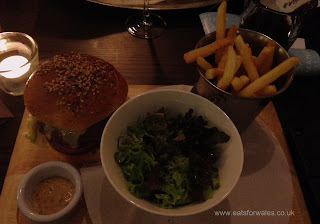 The atmosphere inside was jovial, and adjoining tables chatted away, making for a thoroughly fun dinner experience. I have to praise the front of house staff too, organised, efficient and keen to ensure that everyone had a good time. As an advert for The Celtic Manor they did well. Wales may get the occasional scorcher of a summer, but lets face it, while the rain may mean a beautiful lush green landscape, we're not exactly blessed with an overabundance of sunshine. In fact we have a 'maritime' climate, mild and damp with 1360 hours of sunshine every year against England's 1436 and at least 2000 hours in Central France. Given this, you may be surprised as I was, to learn that Yell.com lists a grand total of 13 vineyards in Wales! Why am I looking up these riveting facts? Recently I was offered the opportunity to try some Welsh wines by Fine Wines Direct, a Cardiff based wine retailer who carry the Ancre Hill Estate. For those of you not in the know (like me), Ancre Hill is a vineyard in Monmouthshire, growing Chardonnay, Albario and Pinot Noir and the estate is biodynamically farmed. The first bottle I tried was Ancre Hill Estate Sparkling Wine £21.99 and I have to say this was genuinely a pleasant surprise. Very pale in the glass and with a pleasant citrus note, more of grapefruit lemon, this would make a lovely refereshing Christmas morning lunchtime aperitif, although at this price point, not one to slosh around in some bucks fizz! This bottle comes with a couple of awards (Silver from Decanter and Bronze from International Wine and Spirits), and I could see why. The second bottle was the Ancre Hill Estate Pinot Noir 2010 £18.99. I wanted to love this wine after the first great bottle, but I'm afraid I couldn't. Pinot Noir is a lighter wine that is less expressive than a bolshy Shiraz, but even so I found the mouthfeel a little thin for my tastes. This wine definitely benefits from decanting to bring out some of the complexity but at the price, this one wasn't for me. It is encouraging to see Welsh wines moving outside the 'novelty factor' bracket that they occupied a few years ago, and I'd be more than happy to serve the sparkling to guests! The rose has garnered some very positive write-ups so I'll be trying that one next. These were both still pretty young wines so it will be interesting to taste their later bottlings, particularly from the 2009 Pinot which also tasted well. The wines were provided by Fine Wines Direct and were complimentary. I have a confession to make. I love sherry. And no, I'm not currently sporting a blue rinse or sipping Bristol Cream from a schooner. I'm talking proper sherry. Bone dry, super cold fino or manzanilla, nutty, complex amontillado or palo cortado, or my all time favourite dessert wine, pedro ximinez, perfect with a chocolate brownie. Despite having converted a handful of friends to the cause, most people still think I'm bonkers when I confess my love for Dot Cotton's favourite tipple, but I have found kindred spirits at Bar 44 in Cowbridge as our Twitter conversations will attest. I've been threatening to visit for some time, but when I learned that they were hosting a gourmet 'tapas y copas' evening with paired sherries and other Spanish wines from González Byass (£48.50) I booked in. The evening kicked off with Rebujito’s (a fino cocktail) or Vilarnau Brut Cava NV, olives, almonds and pan catalan before we were seated communally around tables stuffed with cutlery and glasses. I was thrilled to find myself on the same table as Allison and Lucie from González Byass, although considering the grilling about sherry and wine they received, they may have been less pleased than I was. 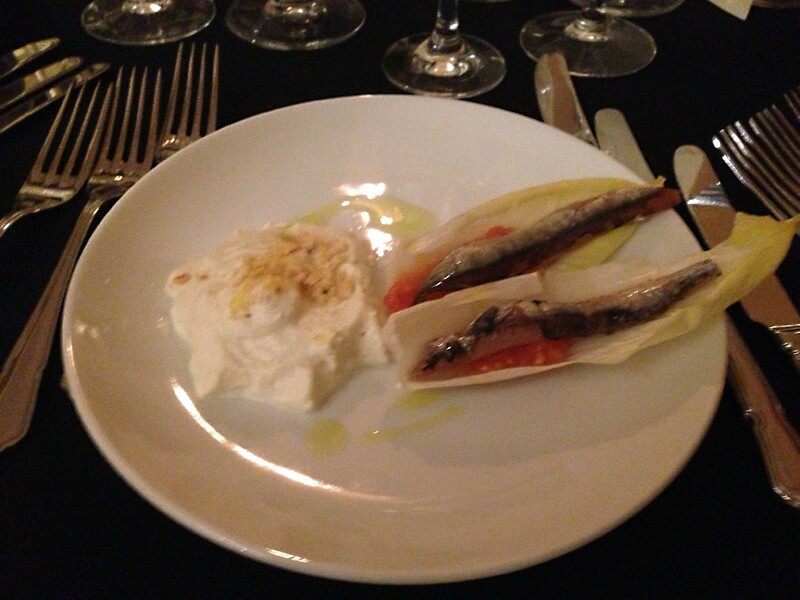 The first course of Nardín Beech Smoked Anchovy, Chicory, La Peral Mousse and crushed Hazelnuts is what the phrase 'so wrong it's right' was made for. Certainly on paper, blue cheese with oily smoked fish would just be plain wrong. However the reality was that the intense flavour of the cheese, mollified in a feather light mousse, complemented the lightly smoked fish well. This was perfectly paired with the big-hitter of the González Byass, crisp, and super dry Tio Pepe fino. The second course of Gower Crab and Prawn Croqueta, Saffron Alioli, Tomato dressing was the course I was most anticipating and I wasn't disappointed. Beautifully crisp breadcrumbs gave way to sweet, meaty, salty prawns and crab. Utterly delicious and I could have eaten a bucketful. This was paired with Viñas del Vero Chardonnay Macabeo. Chardonnay wouldn't normally be my first choice but this wine I learned, had been spared heavy oak aging which made for easier drinking. The third course was Calasparra Rice braised in Shellfish stock and Squid Ink, seared Hake, Green alioli and everyone agreed that this was the surprise plate of the night. The seasoning here was all with the delicious rice, the naturally mild flavoured hake treated simply and all the better for it. The course was paired with La Miranda de Secastilla Garnacha Blanca, probably my favourite and the most complex of the whites that we tried. The fourth course of Baked Torta de Barros, Black Pig Sobrasada on Toast, Caramelised Shallot and Quince Relish was probably the least successful course for me, the Sobrasada toast being a touch too oily once paired with the also oily cheese. The sweet/sharp relish however was fantastic and would make a great addition to a cheeseboard. By now we had progressed to the reds and tried a Viñas del Vero Cabernet/ Merlot, quite a soft, easy wine. The fifth course we were confidently back on form with Castilla braised Shin of Local Beef, Piquillo Pepper, Pea Purée, Pancetta, Pea shoots. Pea puree can easily be bland but this was anything but. An intense hit of sweet pea, cranked up to 11 by pea shoots was a good counterbalance to intensely savoury beef and wafer thin, crisp pancetta. This was paired with my favourite red of the night, Beronia Rioja Barrel Fermented Tempranillo. I was warned by Allison and Lucie from González Byass that this would be a special Rioja and they were right. This wine is no shrinking violet and needed to be paired with robust food that can stand up to it. The sixth (and final) savoury course of Iberico Pork, Grilled Presa, Braised Cheek in Oloroso, Chorizo and Kale, ‘Ibérico Chips’was meal sized and I was disappointed not to be able to finish it. Special mention here has to go to the braised cheek, which was meltingly tender enough to be eaten with a spoon. I had to ask Tom what 'Presa' was, and apparently it is a specific cut from the shoulder which is suitable to light cooking and was served pink here. The course was paired with Finca Constancia Parcela 23, another soft, easy drinking red. The dessert course read like a who's who of Spanish sweetness, Flourless Catalan Almond, Lemon and Orange Cake, Raspberry Crema Catalana, Sangria Sorbet, Turrón Ice cream, Pedro Ximenez and Raisin Ice Cream, Sweet Olive Oil and Carraway Biscuit matched with González Byass Nectar Pedro Ximinez (what else!). By this point I was insanely full and only managed a spoonful of each component. The flourless cake was my favourite, closely followed by a smooth, rich Crema Catalana, livened by sharp raspberries. For me, PX really needs chocolate to bring it alive and the syrupy consistency didn't really work with the sorbet. This was my first visit to Bar 44 and there was some very impressive and consistent cooking on display supported by an efficient and friendly front of house team. I left feeling not only full, but satisfied, the way I do after a dinner that challenges with clever flavour and texture combinations. The imminent opening of a new bar in Penarth is an exciting development for the team, like many others, I will be watching with interest!